The U.S. government has stolen $15,876,457,645,132.66 from future generations of Americans, and we continue to add well over a hundred million dollars to that total every single day day. The 15 trillion dollar binge that we have been on over the past 30 years has fueled the greatest standard of living the world has ever seen, but this wonderful prosperity that we have been enjoying has been a lie. It isn’t real. We have been living way above our means for so long that we do not have any idea of what “normal” actually is anymore. But every debt addict hits “the wall” eventually, and the same thing is going to happen to us as a nation. 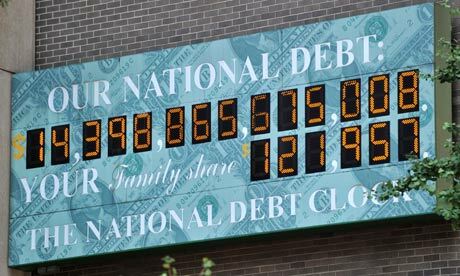 At some point the weight of our national debt is going to cause our financial system to implode, and every American will feel the pain of that collapse. Under our current system, there is no mathematical way that this debt can ever be paid back. The road that we are on will either lead to default or to hyperinflation. We have piled up the biggest debt in the history of the world, and if there are future generations of Americans they will look back and curse us for what we did to them. We like to think of ourselves as much wiser than previous generations of Americans, but the truth is that we have been so foolish that it is hard to put it into words.